Analysing the fundamental challenges and changes in scholarly publishing has filled countless posts, conferences, books and journal articles. Detailed insights into the story of these changes and the development of new approaches are brought to light through a survey of university publishing practices within Australia. The survey, conducted by the Council of Australian University Librarians Library Publishing Advisory Committee (CLPAC), revealed the diversity of approaches in the universities’ scholarly publishing ventures. Further, findings demonstrated that open access has been widely accepted, with a stronger impact in social science and the humanities, fundamentally changing access to scholarship and the role of libraries. Why look “down under”? Australia has been a vanguard in applying new models for scholarly communication – as a nation it embraced institutional repositories through government funded projects such as Australian Research Repositories Online to the World and the Australian Scheme for Higher Education Repositories. Australian university presses have generally been more innovative than many presses in the UK and US. They have a relatively recent history, Australia’s first scholarly press, Melbourne University Press, was established in 1922. Arguably the newness, size and nature of working in a small nation has enabled a nimbleness and flexibility that has encouraged testing of new models, particularly in the past decade. A vision of benefits to the nation through an informed citizenry, and indeed an informed world, fostered a range of university initiatives. The past decade has seen many challenges and opportunities for publishing, including new interdisciplinary approaches, new technologies and new ways of contributing to public debate. Enabling access for the public and indeed the world has been a major theme, well documented by experts such as Danny Kingsley. University libraries have traditionally been the repositories for their clients to access physical and online collections and resources produced by publishers around the world. Developments within the theme of “libraries as publishers” have followed three main streams. Firstly, the most widely recognised is the role of libraries as republishers. In this mode, libraries manage repositories to enable works that have been produced by scholars in their institution to be available to all through making individual journal articles, conference papers, book chapters, and other material discoverable and accessible. With the exception of theses, the material is generally either author accepted manuscripts or works for which an article processing fee has been paid. Secondly, libraries have provided distribution services for online versions of high-impact, peer-reviewed journals and other scholarly content. Stanford University’s HighWire Press and Johns Hopkins University’s Project MUSE were initiatives developed under this model that radically reshaped publishing. HighWire Press partnered with influential scholarly societies, university presses and publishers, creating a service that delivered access to nearly half of the 200 most frequently-cited journals published in the discipline of science. Project MUSE has continued to expand and change and has a wealth of material across most disciplines. Thirdly, is the model where the press is structurally located within the library, or where the library takes responsibility for providing the infrastructure and service for the production of scholarly works, most often in the latter case, journals. Interestingly the finding that one in four Australian university libraries is publishing is a higher than occurs in other countries. Anthony Cond in The Academic Book of the Future reports that “One in six university presses now reports to a library”. On monitoring the development of all three models, our group (CLPAC) believed it was timely to take a deeper dive into current practices. What is happening in the trenches was the major question for an Australian and New Zealand study undertaken in 2015. All universities were invited to participate and 19 (approximately 40%) responded. Though the findings covered a broad range of issues, the primary focus was on the actual publishing of research, not republishing through repositories. The information obtained through this survey suggests that a significant number of university libraries, one in four, support publishing through either their university press or through the production of journals.. 43 journals and 67 books have been published by these libraries and presses so far in 2015, with the number of titles published annually steadily increasing. What is the major impact of publishing in open access through the university publishing initiatives within libraries? Increased exposure and access to titles and content as measured by. over 3.4 million downloads of the ~1,200 resources published by libraries including presses structurally located in libraries. This information was collected after the survey to supplement other findings. While most users are within Australia the reach to other countries is extraordinarily high. Compare this to the average print book run and the extent of dissemination becomes very clear. For large university presses estimates are that print runs estimates are that have fallen significantly in the past decade to around 400. Compliance with dissemination requirements of funders. 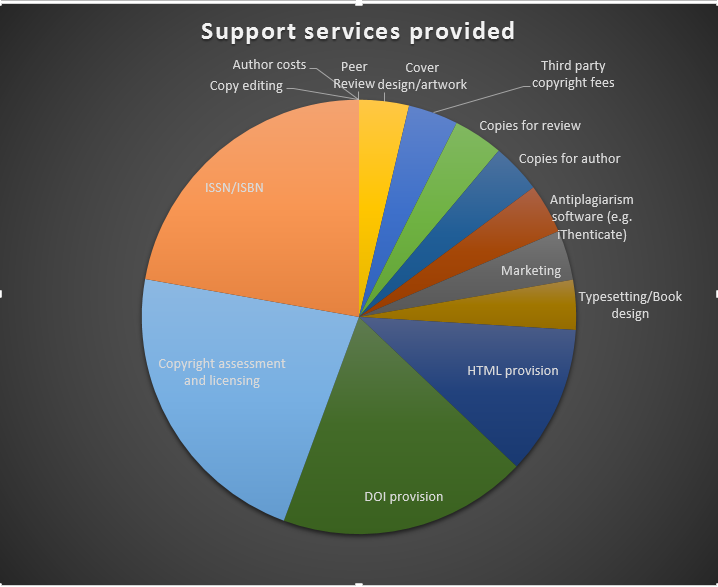 While open access is often a key goal for the provision of publishing services, it is worth noting the nuances and models attributed to this concept. The publications have a wide variety of open access models, 66% are green open access, with 11% each Gold, Hybrid and Diamond. The role of academics is vital. Active editorial boards, writers and peer reviewers are fundamental to the operation and the libraries and presses. The full survey report has information on the operational approaches. 90% of the funding for the publishing was from the university’s direct allocation of funding to the library. Publishing was most typically conducted with less than two staff (seven had 0 staff resources for the function, two had five). The services are being provided within current resources, based on developing new skills and services and reinventing library services. Most of the responding libraries publish a small number of titles each year. The software used is primarily OJS and BePress for smaller publishing institutions with large publishing enterprises mostly using in-house systems. Optimisation of technology for enhanced publications. Australian National University Press is a fully open access publisher publishing monographs and journals. It has been established for more than 11 years and lists in excess of 650 titles. All publications can be ordered as print on demand copies. There are three series – Press, eView and a new ETextbook series. Publishing online and open access has resulted in over 20,000 downloads from readers in more than 122 countries in each of the years 2014 and 2015; more than a decade after it was first published. The life of the book has been radically extended – where it would have been available for a couple of years if only produced in the print format. It is now more widely read than in the first 5 years of publication – a reversal of the long tail effect. The author reports that academics and post graduate students in countries, and indeed continents, where there would not have been a single copy of the book if it was published online in print have contacted him after reading the book and built relationships with researchers and students around the world including Africa, Europe and North America. The University of Adelaide Press is a fully open access publisher of books, all of which are available in both a print edition and a free e-book version. There are over 50 titles from disciplines including the Arts, Law, Economics, Medicine and Electrical Engineering. Since 2009, the titles have recorded over 600,000 downloads in 137 countries and have been cited at least 400 times. Kym Anderson has published 10 titles and has found that his books achieve more downloads than those he has published with the World Bank in open access. In 2014 his title Which Winegrape Varieties are Grown Where? was awarded ‘best viticultural book’ by the prestigious Paris-based Organisation of Vine and Wine and ‘best digital wine book’ by the Spanish-based Gourmand International. Monash University Publishing is a hybrid publisher, publishing monographs and some journals with scholarly titles available through open access. It has been established for more than 5 years and has a significant title list. Monash University Publishing books are published online in e-book format and are available for download to mobile reading devices. Jean Galbraith: Writer in a Valley is the compelling story of Jean Galbraith (1906–1999), one of Australia’s most influential botanists and writers on nature, plants and gardens. As a garden writer, she was particularly notable for spreading knowledge of Australian flora and encouraging the cultivation of natives in home gardens. As a botanist she wrote accessible field guides to Australian wildflowers that made a vital contribution to the conservation of native plants. Her nature writing evoked the spirit of places she knew well and introduced readers to the beauty of the Australian bush. During a writing career that began in the mid-1920s and spanned seventy years, Galbraith developed new forms of garden writing in Australia and turned botanical writing into a literary art. Libraries have made a significant contribution, through professional skill and expertise, in the revolution of scholarly communication and publishing. Publishing is now supported through a range of different approaches due to innovative thinking by libraries in a range of universities. Their connection with authors and knowledge about scholarly communication has enabled them to make a unique contribution. This study has found that in Australia and New Zealand new models including open access and hybrid publishing through university libraries and presses in libraries are making a significant difference. The initiatives should not be thought of as examples of institutional intervention when there is market failure. Rather the opposite is true – they have produced award winning monographs and given long, enduring life through providing access to major scholarly works. Over the coming years new initiatives should be developed to expand upon the great successes achieved so far. In the meantime key issues of developing new skills, using new technologies, improving systems and continuing to actively engage with scholars will remain priority issues.